"These are so easy. Sweet and tangy with a perfect shortbread crust." Place 1 1/3 cups flour, 1/4 cup white sugar, 1 tablespoon lemon zest, and the ground almonds in a mixing bowl. Add the softened butter and mix with your hands until the mixture resembles coarse crumbs. Press into the bottom of a 9-inch square baking dish. Bake in the preheated oven until the crust is golden brown, about 20 minutes. While the crust is baking, stir together the brown sugar, 1/4 cup white sugar, 1 tablespoon flour, and the baking powder in a bowl. Add the eggs, coconut, lemon zest, and lemon juice; whisk until the sugars have dissolved; pour over the crust. Return to the oven and bake until the lemon filling has firmed, about 15 minutes. Cool completely in the pan before cutting. Left a super bad aftertaste & looked a little slimey. I was embarassed to serve it to my family. Check out a different recipe! tart, tasty, tangy! leave out the cooconut! 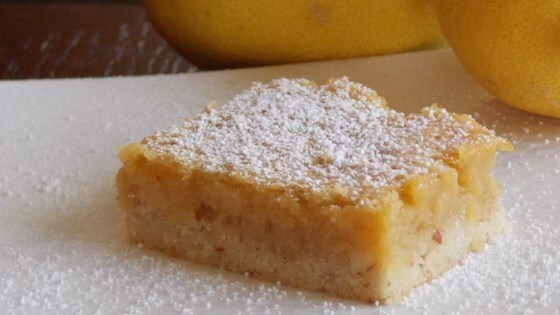 These a really the perfect lemon squares!! I sub. pecans for the almonds and doubled that amount. I also doubled the coconut. They were great and not too sweet. this was yummy! i didn't have any almonds so i just made the crust without it. i'm undecided about the crust maybe if i add the almonds it would have been perfect. i'll make this again.